• Equities Ease. Stocks ended fractionally lower in light volume last week, as investors weighed conflicting signals on U.S.- China trade talks. Early last week, major media reported that China had offered to buy $200 billion in additional U.S. goods and services to reduce the trade surplus, but Chinese officials later denied making such a proposal. • Tepid Declines. For the week, the S&P 500 and Dow Industrials both fell 0.47%, while the Nasdaq Composite declined 0.60%. In contrast, small cap stocks outperformed relative to the S&P 500, with the Russell 2000 Index gaining 1.27% last week, ending at a new all-time high. • Energy Led the Week. With oil prices reaching a four-year high, energy companies (+1.73%) gained the most last week among the 11 major sectors groups, followed by Materials (+1.62%) and Industrials (+0.79%). Real Estate (-3.08%), Utilities (-2.88%) and Technology (-1.48%) fell the most. • Key Economic Data. April housing starts fell by 3.7%, reversing much of March’s increase and permits declined by 1.8%. Meanwhile, the Leading Economic Index, which combines 10 economic metrics to measure the pulse on the U.S. economy, rose for the sixth straight month. • 10-Year Treasurys Top 3%. The yield on benchmark 10-year Treasury notes closed above 3% every day last week, the first time that has happened since 2011. The U.S. Dollar Index posted its strongest week since 2016, while gold slid and Treasurys eased, sending the yield on 10-year notes up 8.6 basis points to end the week at 3.057%. Chart of the Week: New Milestone in Thirteen Months? 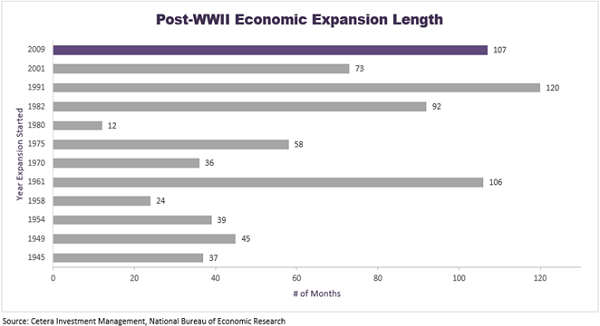 The current economic expansion, which started in June 2009, is officially the second-longest in U.S. history. The present recovery has now lasted 107 months, trailing only the 1990’s economic boom, which lasted 120 months. The rate of GDP growth has been subdued relative to previous post-war expansions, a factor which has actually helped to extend the current cycle. Economic activity has been growing slowly but steadyily for nearly nine straight years, and this may continue, given that traditional recession indicators are still benign. Historically, economic growth has been weak in the years following a financial crisis, and this has been the case on a global scale since the 2008-2009 recession, as other developed economies, including Europe and Japan, have similarly dealt with tepid growth. Unlike the U.S., however, both Europe and Japan have experienced double dip recessions following the global financial crisis, while U.S. domestic GDP growth has held relatively steady for 107 straight months. Eventually a U.S. recession will occur, but for now, the U.S. economy is still on solid footing and the Fed's normalization of interest rates has remained on a conservative path. We are currently 13 months from this expansion becoming the longest on record.